Welcome to the site. I am the author of the Skunk Moses, Jamboree Jones and Leland Blake mystery series. Links to the individual sites are in the sidebar to the right. Tips on writing and publishing/promotion are in the menu tabs at the top. 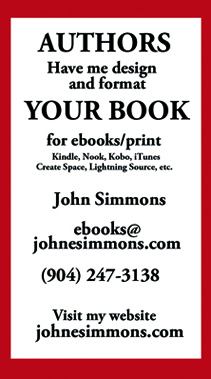 I also specialize in providing book design and eBook formatting services for authors and publishers. Click on the above “Book” or “Children’s Books” menu items for links to some of the work. There’s additional information in the tab at the top. To take advantage of our services, click on the contact link. Member of The Florida Writers Association and the Southeastern Writers Association.